Have you heard the latest buzz in the green beauty world?? There is a new online store that launched last week, and it has got me and everyone I know excited! Rare Beauty is dedicated to all things natural, and promises to deliver cruelty free, nontoxic skincare that comes in eco-friendly packaging. Not only that, but it has also taken a truly innovative approach and is completely women-led -- girl gang on all fronts! 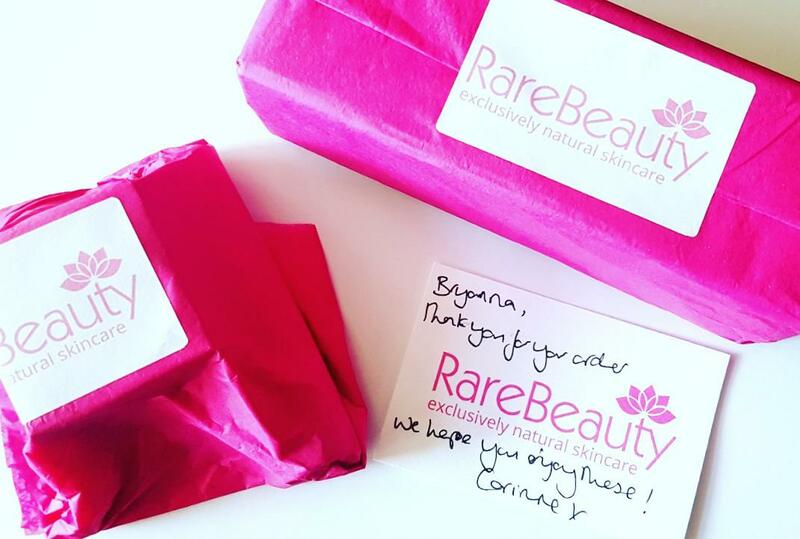 From Corinne, the founder of Rare Beauty, and the business owners of the featured products to the "Rare Residents," each person involved in this luxurious ethical online shop is a lady boss, pure and simple. When I first heard about Rare Beauty, I was immediately interested. I love all things eco-conscious, and knowing this shop would offer both environmentally friendly options along with providing a platform for boutique brands created by strong, intelligent women, I was quickly sold and new this would become a favourite place of mine to browse. Even before the launch I knew customer service would be lovely -- anytime I asked a question or posted a comment on Twitter, Corinne was there to respond. With so many online retailers popping up, this is something that sets Rare Beauty apart from the rest, and it is one aspect that will keep me shopping with them for the long haul! At the moment there are eight brands available on the website: MyRoo, Alexa Sky Botanicals, Mallow + White, Bloom Remedies, FreyaLuna, Nakin, and Magical Tree. 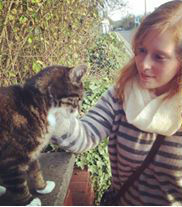 And all are small to medium sized women-led small batch businesses - that's a mouthful, I know!. Since there is limited stock, this means every single product is made with care, and each formula will be of the highest quality. I love that Rare Beauty is introducing brands over time, as I have to admit I am prone to becoming overwhelmed by the sheer amount of choice presented to me sometimes. Especially when everything looks amazing! That being said, the website really helps navigate some of that indecision, as it lets you browse by brand or by product type. Skin, Hair, and Body are currently the available tabs, and under each of those there is further specific searches, like cleansers, moisturisers, or masks. And when you are in the section you want, you can zero in even further by searching by skin type and eco criteria, or even use a helpful "residents recommend" function! I found this made it really easy to jump around looking at things I knew I needed or would like to sample. While you can do a blanket search for vegan products or 100% natural origin ingredients, one thing that would make searching even easier would be to have a clear marker on the product page itself, either on the description or ingredients tab, of what categories each products fits in. While some individual listings do mention they are vegan friendly or are all natural, others have no indication of whether or not the item in question is suitable. Having a consistent key might be helpful, like having a little V symbol attached to the image. 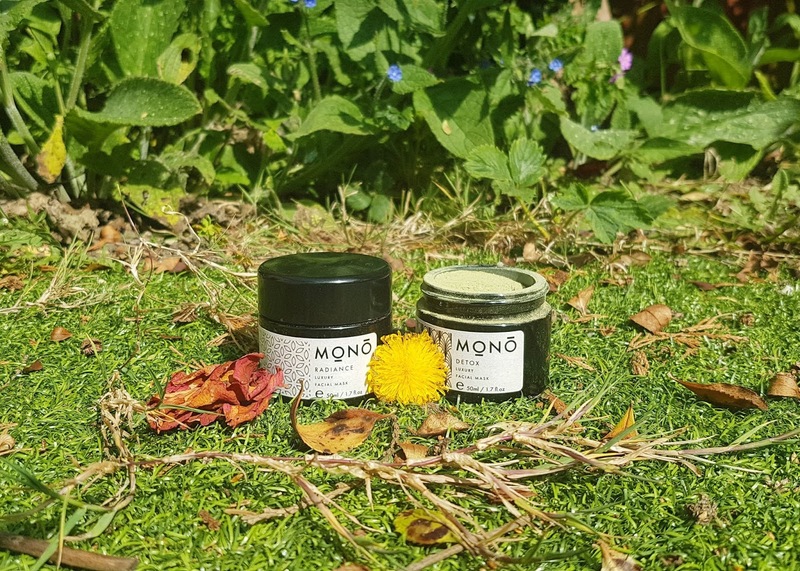 I have already had the pleasure of trying products from MyRoo, FreyaLuna, and Mallow + White in the past, and can say with certainty that what they create is absolutely lovely, and if you would like, I can dedicate a post to those fab brands. With the launch of Rare Beauty, I wanted to take this as a chance to try out some names I had not yet been able to test out. After about twenty minutes of debating with myself, and reading each of the business' stories and mission statements, I decided on two I have had my eye on for a while as well as one that was completely new to me -- Nakin, Alexa Sky Botanicals, and Bloom Remedies (don't worry Magical Tree -- I will be coming back for you!!). And after another thirty minutes of adding and deleting and adding and deleting items from my cart, I had finally chosen three products -- an eye serum, a lip balm, and a floral toner. Check out was super easy, and there were no hiccups in the process, and no grueling "prove you are human" or "give us your life story" forms to fill in -- just simple billing and shipping information. Shipping is a standard £2.95, but if you hurry you can grab 20% off your order PLUS free delivery by using Rare Beauty's special launch discount code RBlaunch. My parcel arrived just two days later, and I was happy to see that it was clearly packed with care and all my glass goodies were safe and sound. 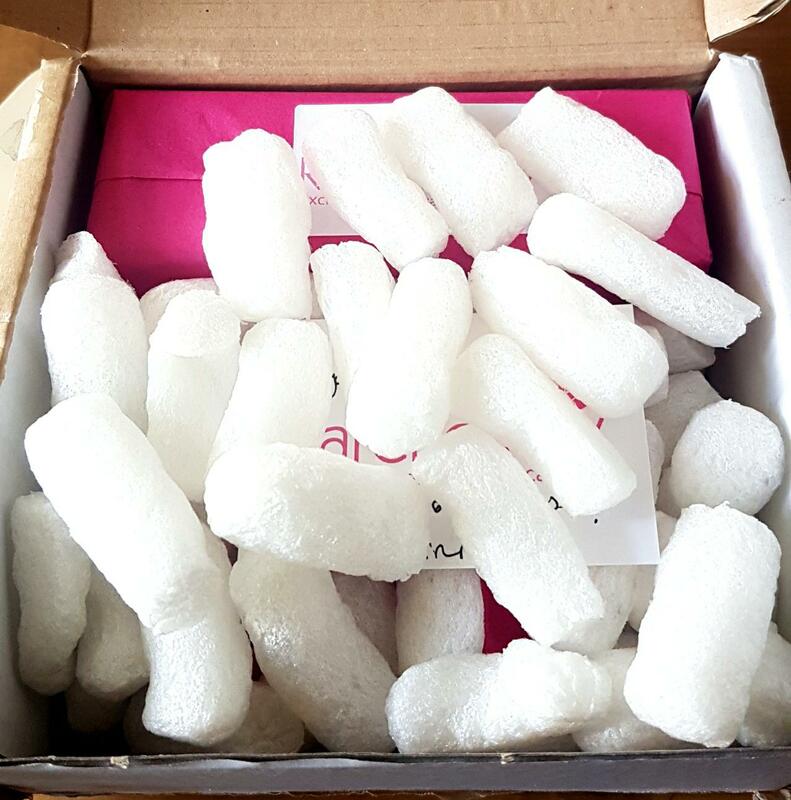 All the packaging was eco-friendly, from the recycled box and biodegradable packing tape to the recycled tissue paper and biodegradable loose-fill. I was told that even the thank you card is made from old t-shirts! Like I said, I chose a lip balm from Nakin, a floral toner from Bloom Remedies, and an eye serum from Alexa Sky Botanicals -- two of these came in lovely cardboard boxes that have the ingredients and use by dates clearly printed on the back, and one I was happy to see came free from any extra packaging! I'm always on the lookout for products that have as little waste as possible, so this was an exciting find. Each product is contained in glass, though I do believe each has a plastic lid. But the less plastic the better, so I am happy to have found some new lovely brands that are primarily plastic free. I have been using these all natural treats for almost a week now, and I can say I am impressed with all three! The Nakin Natural Anti-Aging lip balm is unlike any I have tried before, as the formula is neither wet like a gloss or firm like a typical balm. It is a hybrid, which makes for super easy application and extreme hydration. The balm doesn't just sit on the lips, but slowly absorbs so your lips are not left sticky -- I find there is nothing worse than a sticky lip product, as my hair gets stuck in a gloopy mess whenever the wind blows. This is one I can wear in our out since I don't have to worry about any mishaps. I chose this because I adore anything with mint. It does smell lightly of mint oil, but is not overwhelming which is refreshing. I was also curious about the plumping effect it claimed to have. While not a quick fix, it does indeed leave my lips looking fuller, but more importantly they look and feel healthier. With all this extra sunshine, I am making an active effort to protect any skin exposed, and this is a great post-sun treatment. For only £10 for 15ml of a high-quality, high-performing product, I think this is brilliant value and it might be one item I keep coming back to. 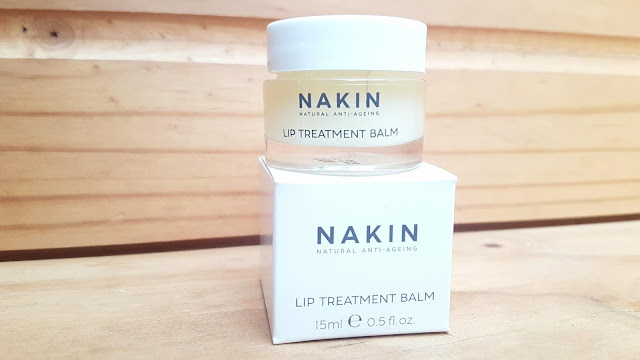 I will definitely be trying more from Nakin in the future, as I am well impressed by this lip balm. 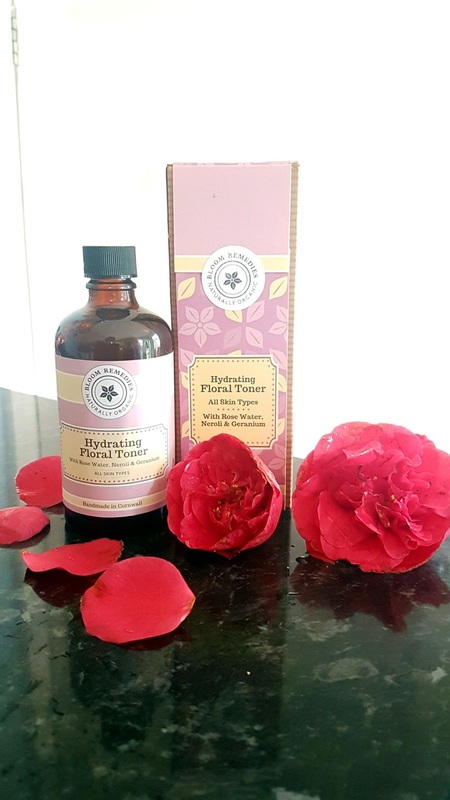 The natural toner from Bloom Remedies is gorgeous as well, as it utilizes orange blossom, geranium, and rose water to gently purify the skin. It smells like a summer bouquet, and is so refreshing to use both because of the calming scent and the coolness of the hydrosol. This product is free from harsh additives, meaning there are no artificial fragrances or drying alcohols found in the ingredients label -- this is ideal for me as my face has gotten slightly more sensitive in recent years. It can be incredibly frustrating buying a product as I have to check every single ingredient to make sure phenoxyethonal isn't included and I have to read loads and loads of reviews to check any essential oil content isn't too strong. Otherwise I end up using something for the first time and ending up with angry red skin that feels like it is on fire. Well, this toner poses no problems for me I am happy to say! Bloom Remedies has only used floral waters rather than oils, so this is incredibly gentle and soothing. My skin drinks up anything with rose water, and this blend is no exception. My only wish is that there was an option to have a spray nozzle, as I love spritzing with floral waters. However, I will say the twist cap saves on excess packaging and is great for applying directly onto a (reusable) cotton round. I use this after a shower to help my tight skin feel hydrated, or when I wake up to help prep my skin for the day. And I will say again, this is a great option for those on a budget, as it is only £12 for 60ml of product. 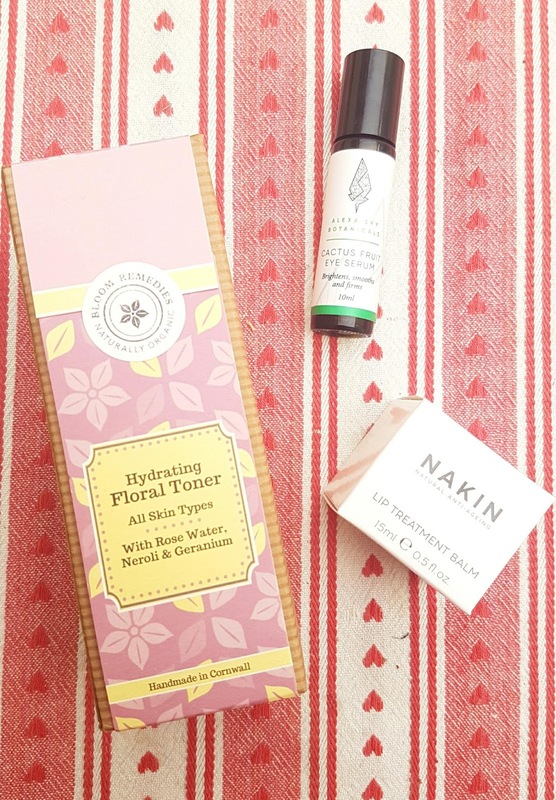 I can't wait to test out more from this all natural brand, and am already eyeing up the hand and body wash! Ingredients: Aqua, Rosa Damascena flower water*, Pelargonium graveolens flower water*, Citrus autantium amara flower water*, Lavendula augustifolia flower water*. *= Organic ingredient. contains Geraniol, Linalool, Limonene Citranellol, natural components of essential oils. 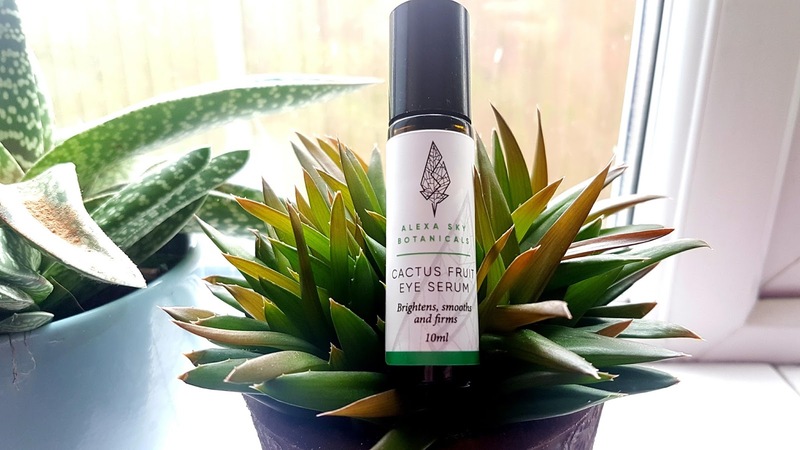 I have mentioned before how sensitive the skin under my eyes is when talking about eye creams and gels, so I was both really excited to try out Alexa Sky Botanicals Cactus Fruit Eye Serum but also a little nervous to see how my skin would react. Products that are too heavy or rich cause little red bumps, not quite spots, not quite hives, to appear around my under eye area, so I was crossing my fingers that would not happen with this brightening, smoothing, and firming roll on. I am happy to say so far so good! While this is entirely oil based, it is much less heavy than I was expecting and even though it feels incredibly luxurious, it is also super light. Perfect for my fussy skin! The blend of oils has been designed to target puffiness, dark circles, and fine lines, and I have to say my eye area has definitely been looking less dull and tired since starting to use this. The tube is also really convenient for those of us who are a bit more forgetful -- I can keep this upstairs on my side table to apply if I forget during my regular routine, or pop it in my purse for a quick application on the go. Plus, since it is 10ml, it is perfect for travel -- this will definitely be making it into my suitcase for my next trip. I love this product so far, and find everything about it unique -- the smell is unlike anything I have used before (both grassy and earthy), the consistency is like air, and the roll on applicator is so easy to use. Plus, it is charged with amethyst, a crystal that can assist with tension relief , skin irritations, and eye strain -- a holistic approach to beauty is always something I am intrigued by and happy to support! This eye serum has made me really keen to try even more of the Alexa Sky Botanicals range, and I can't wait for the chance to test more of their lovely products. 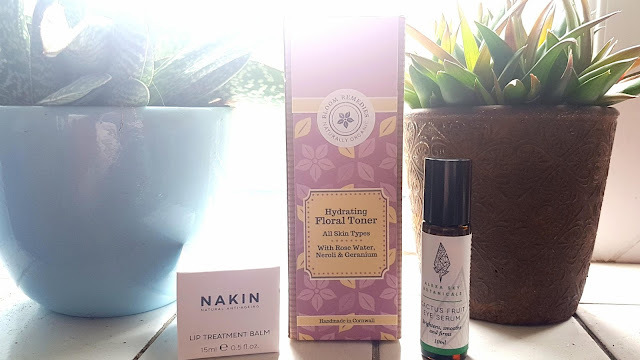 Overall, I have been so happy with my first experience with Rare Beauty, and I will definitely be shopping at this women-led eco-friendly online store again and again! The brands they carry are fantastic, and the variety of products available to try is already so impressive. I cannot wait to watch this business grow, and I am expecting great things from Rare Beauty. So what are your thoughts eco-beauties?? Have you already checked out Rare Beauty? What brands would you most like to try, or perhaps ones you would love to see included in the future? And remember, there is still time to grab the launch offer of 20% off plus free shipping -- but be quick! Use checkout code RBlaunch and let me know what goodies you choose in the comments below! This is the first time I am hearing about Rare Beauty, sounds interesting! I've tried the toner from Bloom Remedies before and it was lovely. I would be interested to see how that eye serum works on my eyes. I currently have quite a few eye products but I always love trying new ones to see which one works best. Oooh I've never heard of this before! I'm definitely going to check them out! It is great that this company use ethical products and ego-friendly packaging. Hopefully they are inspiring other companies to do the same.